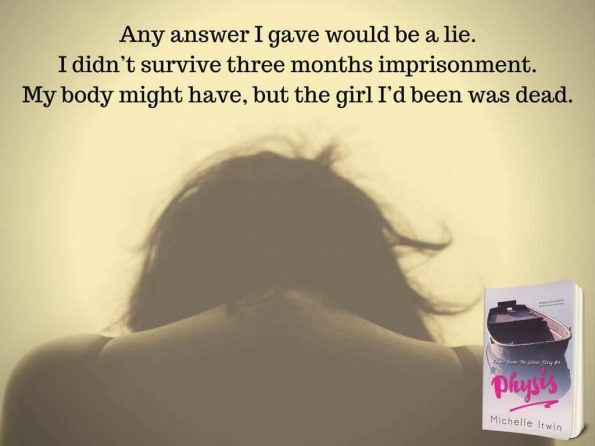 Review – Physis (Phoebe Reede: The Untold Story #4) By Michelle Irwin – 5 Stars!!! Phoebe Reede has suffered at the hands of pure evil; has she got the strength to learn to live again? Or is the fight too much? Can anyone help her to break down her guarded walls and live again? Firstly, I have to start by saying how amazing this series is shaping up to be. This series is worthy of a TV Series without any doubt! A film would never truly give the words that Michelle Irwin writes the full praise and justice that they deserve and even then, a TV Series would have their work, cut out for them. This book is probably the most powerful and emotional yet. I was on a different kind of emotional rollercoaster with Physis. I knew this book would be heart breaking, I just hadn’t fully prepared myself for how heart wrenching and breathing taking this story was going to be. Reading Phoebe’s flashbacks to the weeks of torture and hell she had endured tore at my heart, piece by piece. She was a complete shell of her former self and it was hard to see that she had a chance of ever being even a glimpse of her true self, again. Then we meet her saving grace, the man who has taken my heart by storm and secured a place there forever. I can’t go into too many details without giving away the unique and important aspects of this story. What I can say, is that Beau proves to be even more of an outstanding and amazing man than we ever dreamed possible. He isn’t afraid to try, even when that means he could get hurt himself in the process. He has also found himself a place in the life of the Reede’s whether things pan out the way he hopes with Phoebe. The Phoebe Reede series is unique, thrilling, exciting, heart breaking and heart-warming.